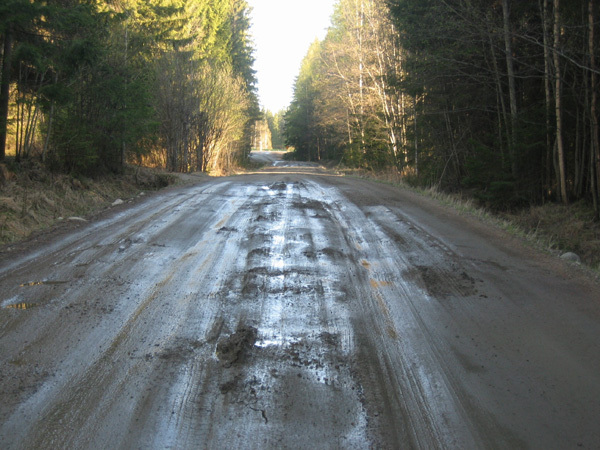 Some soil types and poor drainage together can affect the permanent deformation that causes Mode 2 rutting and pumping.This is a particular problem in Scandinavia where non-homogeneous soils, together with poor drainage, can cause differential frost heave problems in the road. 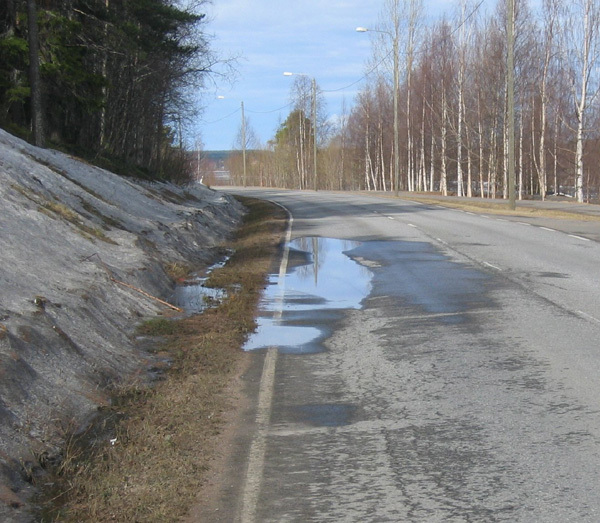 Soil type can cause stability problems in road embankments. Soil type defines the types of special construction materials that can be used in the rehabilitation process. 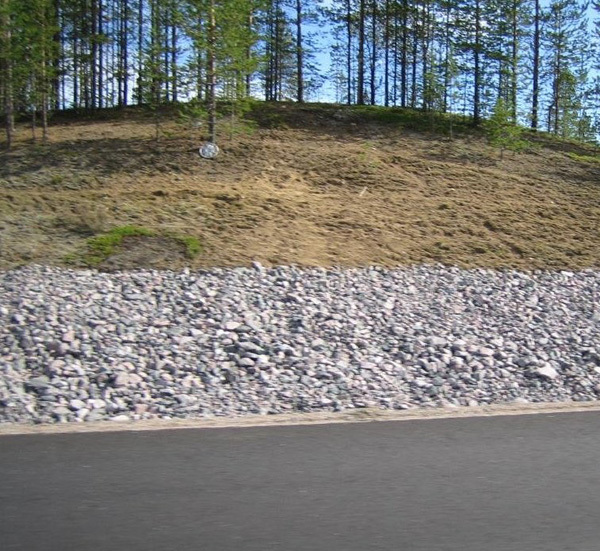 For example, a geotextile in a soil replacement should be used where the subgrade is silt or silty moraine. The topography classification has been designed to help with the selection of special structural solutions against permanent deformation. In these areas standard solutions and structures might be ineffective. Typical topography classes are: 1) flat and even area, 2) side sloping ground, 3) hummock, 4) wet and low lying valley and 5) bedrock. The biggest problem with a road crossing a „flat and even? area is that there is usually a significant distance to the nearest natural drainage system and, as such, it is difficult to get rid of water. 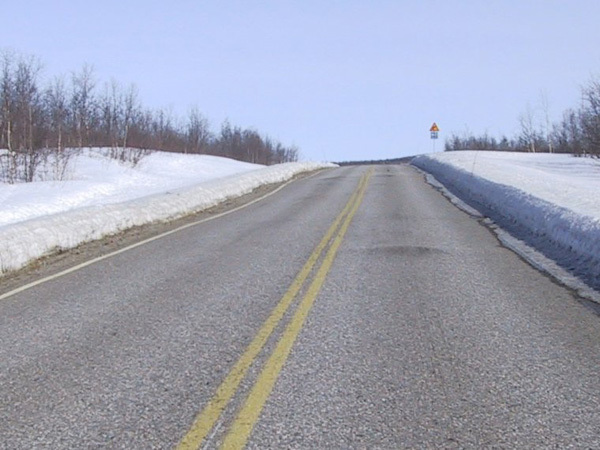 This problem is most apparent during the spring thaw when the ground is still frozen and there is an abundance of water from melted snow and rain. 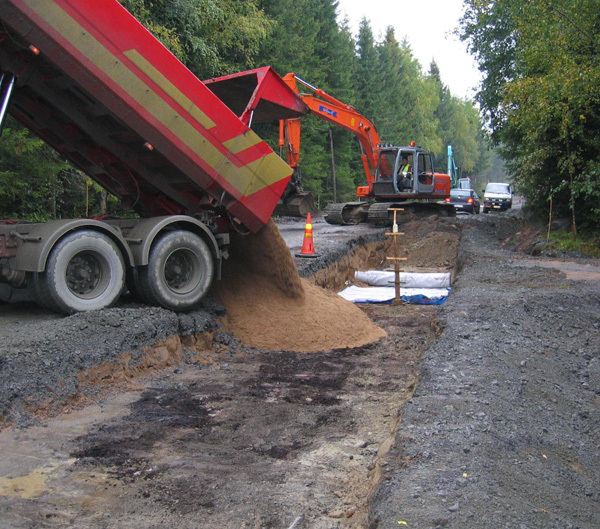 The subgrade may also have problems with draining the surface water during periods of heavy rain. 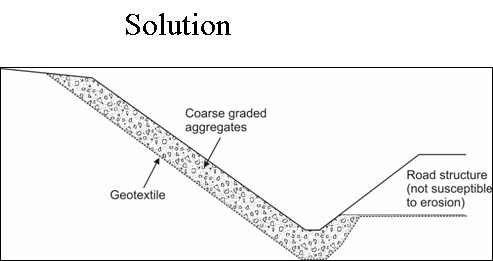 The extent of the problem will depend on the amount of water and the permeability of the subsoil. Raise the grade line of the carriageway. 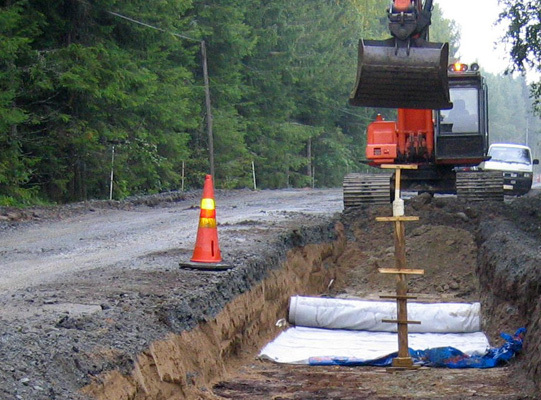 Care should be taken with this however as this solution can increase the loads on the subgrade and increase settlement, especially on peat subgrades. 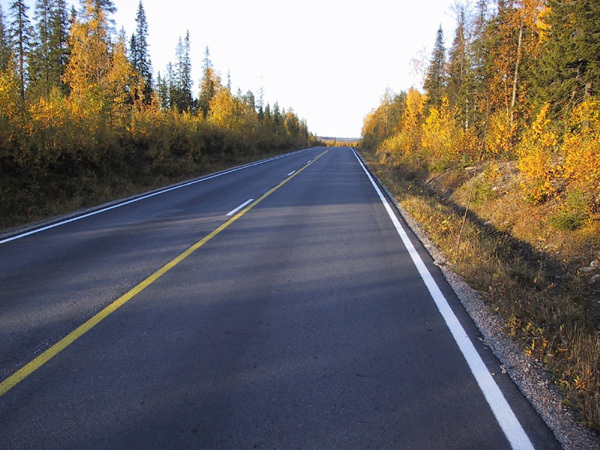 Raising the grade line also helps with winter maintenance as it creates greater space for snow accumulation and snow storage at the side of the road. 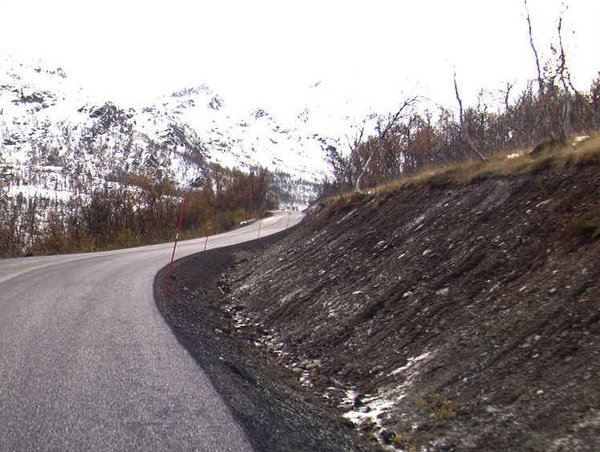 It can however pose problems where the land for the road is limited and this may make the new inner slopes too steep. Use steel reinforcement. This can reduce pumping problems. Consider using new treatment agents if the drainage cannot be improved or the grade line raised. 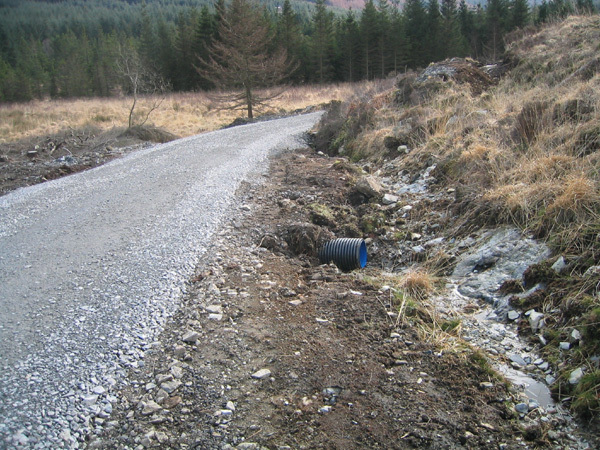 In roads on side sloping ground, the groundwater table will normally be nearer to the road surface (and to the wheel load) on the road cut side. One reason for this is that material from the outer slope naturally flows to the bottom of the ditch and this raises the water table in the ditch. 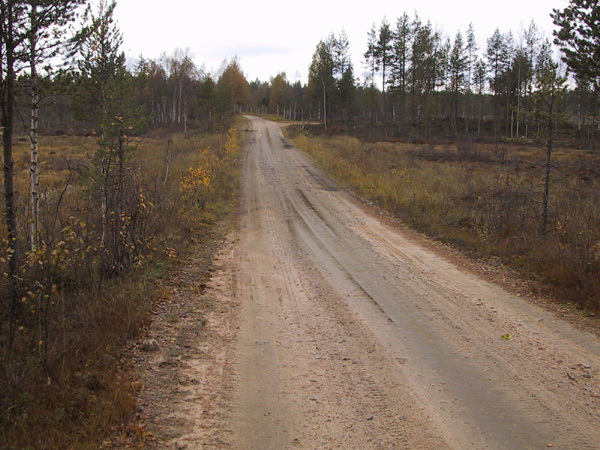 The moisture content in a soil is a function of the distance from the groundwater, and thus the rut deformation in the upper wheel track is usually greater on roads on sloping ground. 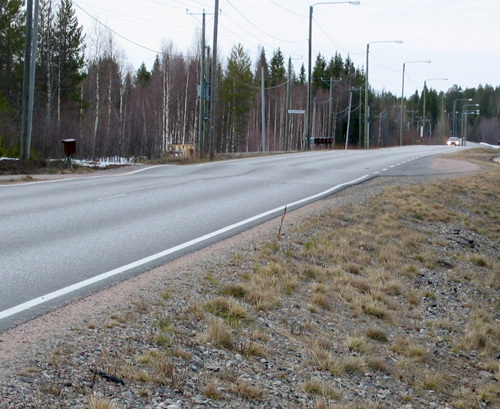 The consequence of this is that rutting on the cut side of the road generally triggers the need for rehabilitation many years earlier than the well-drained embankment side. The lifetime ratio (drained lane / undrained lane) may reach higher than 2. 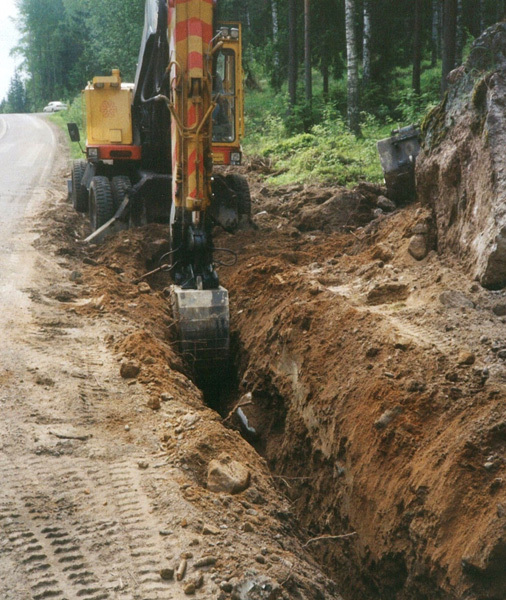 Well working drainage is critical for roads located on side sloping ground. 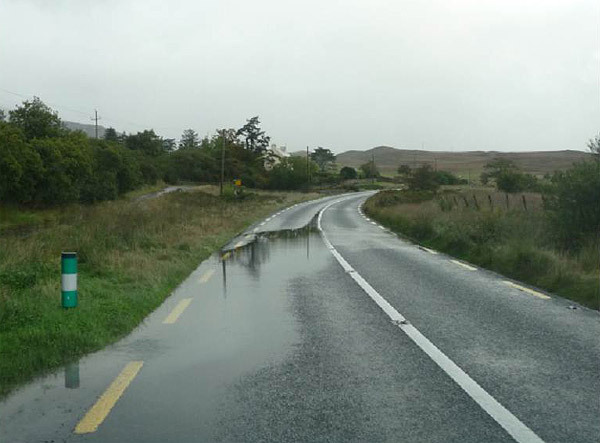 If the drainage fails and water flows into the road structures permanent deformation problems will quickly follow. On sloping ground the groundwater will flow under the road. 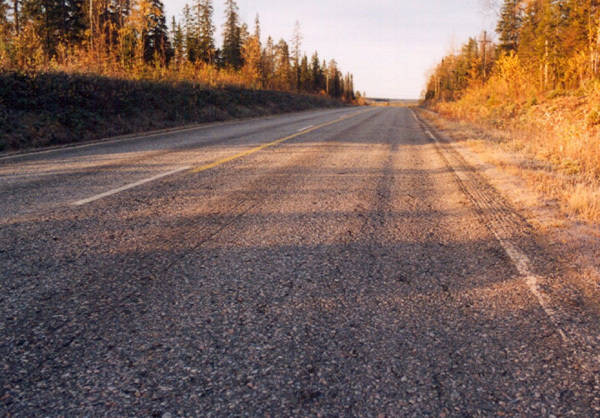 If there is bedrock or impermeable materials near to the road, these obstacles can block or concentrate the groundwater and thereby increase the potential of the adjacent road to develop frost heaves, spring thaw softening and reduced bearing capacity due to high moisture content. Clean the upper ditch and make a support or drainage structure for the upper slope. 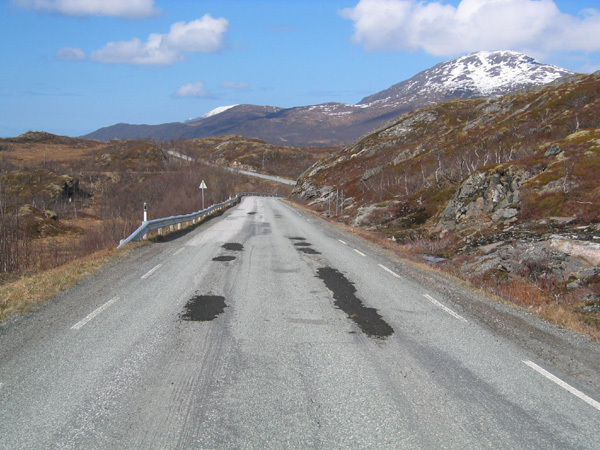 Roads going over, or crossing, moraine hummocks often have special permanent deformation problems, particularly in frost areas. 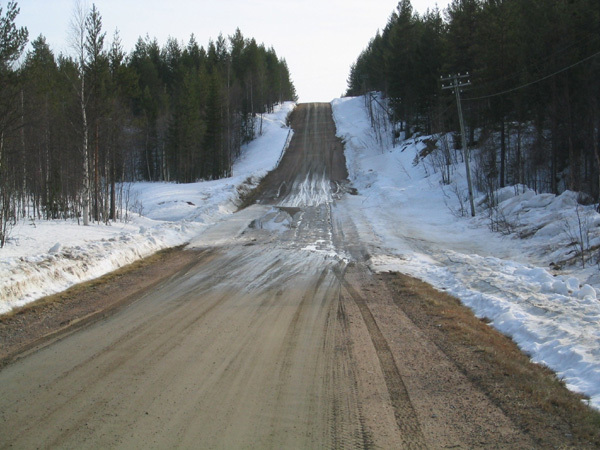 Damage at these hummock sites is generally located on the top of hill or in the transition zone where the road leaves the embankment and the structural layers become thinner. 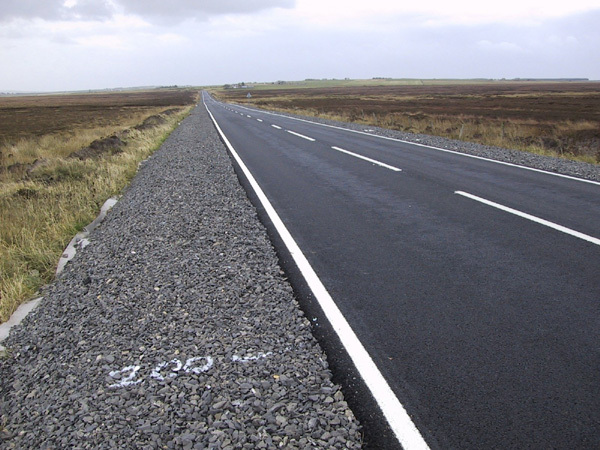 Unlike side sloping ground, softening of the road surface on a hummock takes place throughout the cross section. 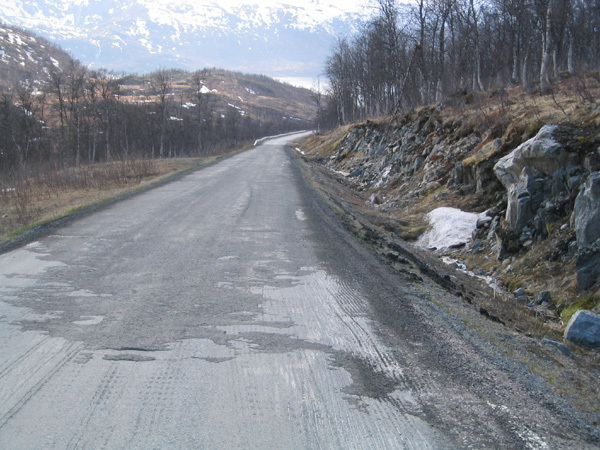 Differential frost heave bumps are also often found in these transition zones during the winter. and ditches get easily filled. 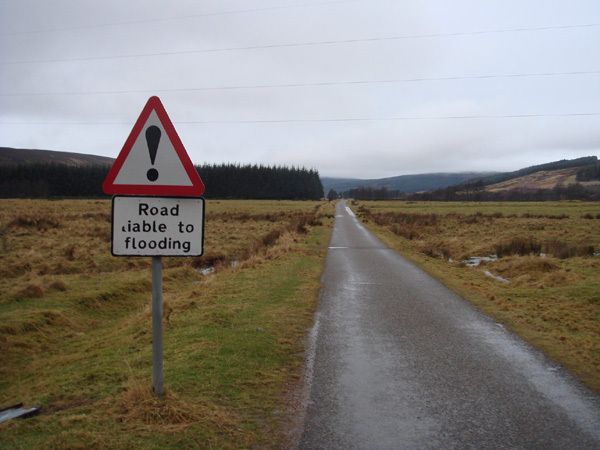 For this reason these sections should receive special attention when designing drainage maintenance measures. 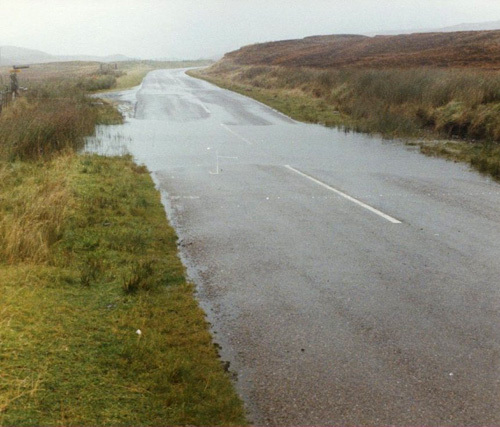 A wet and low lying valley, or hollow, differs from a „flat and even? area in that the usual and recommended rehabilitation solution (with a few exceptions) is to raise the grade line by building a new structure on the top of the old road. A higher grade line provides numerous advantages and benefits. 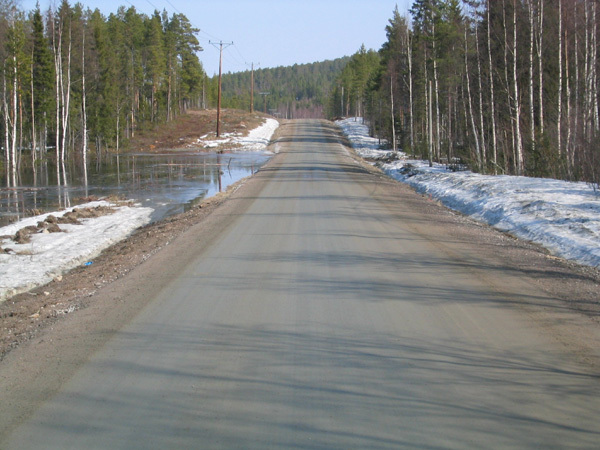 A thicker structure above the groundwater level will increase the bearing capacity of the road, even though the drainage in the valley cannot be improved. 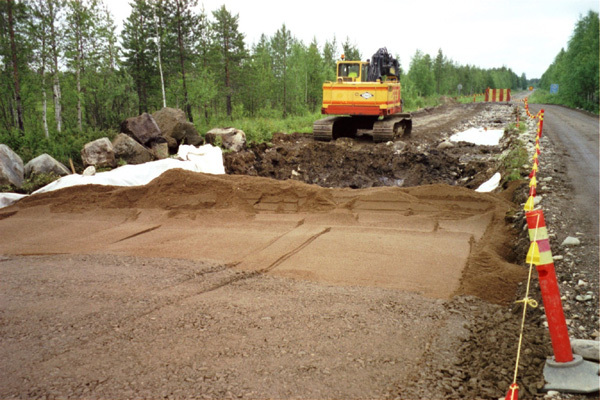 A thicker structure will also provide better resistance against frost heave, and reduce the risk of getting frost bumps around culverts that could cause problems to heavy traffic. 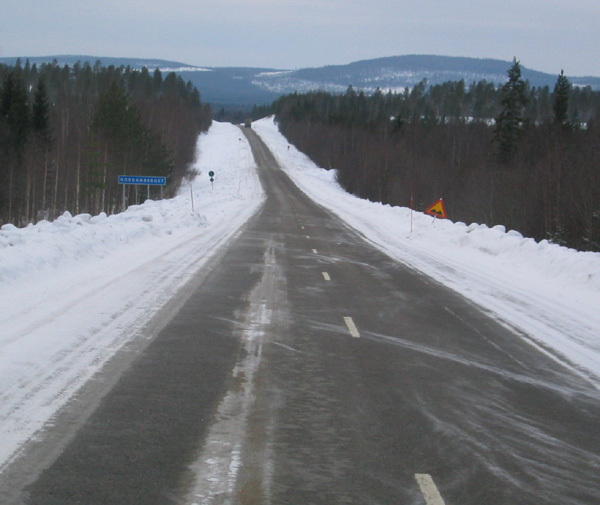 A higher grade line can also help winter maintenance. 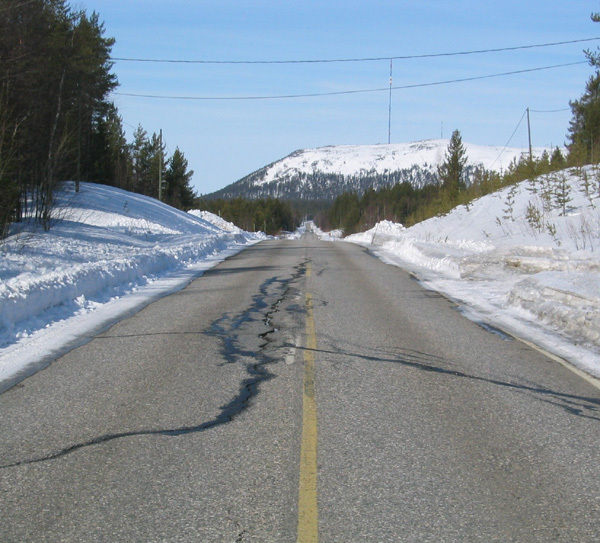 Low lying valleys often have problems with drifting snow, and a higher grade line can leave more space for snow accumulation. Finally an improvement of the vertical geometry will improve traffic safety, especially for heavy traffic in slippery driving conditions in winter, as well as saving their fuel consumption. 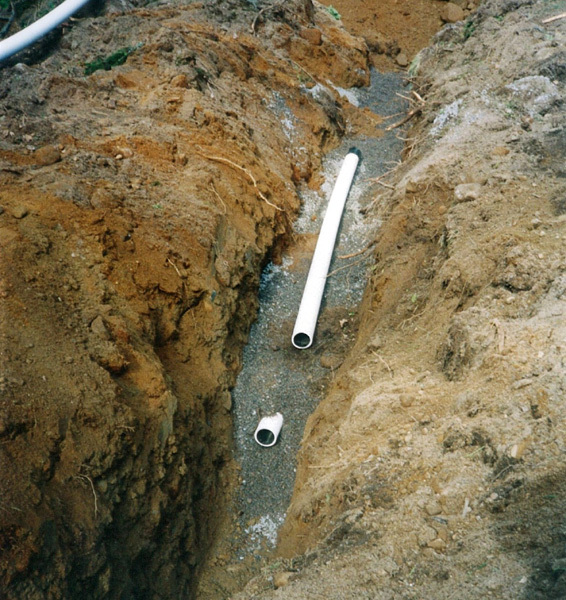 The quality of the subgrade soil has to be assessed however before a decision can be made for a higher grade line. 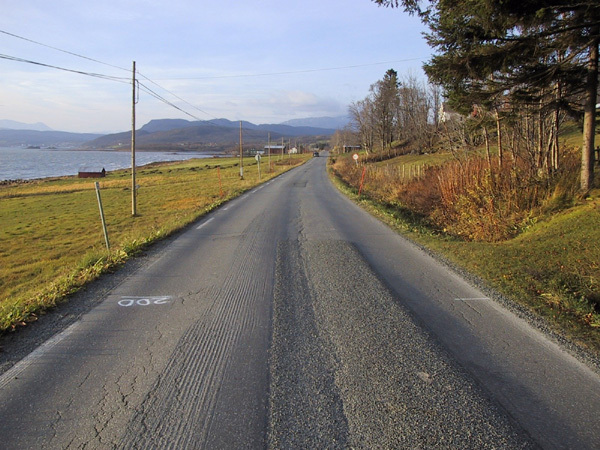 If the subgrade soil is peat, compressive clay or gyttja, the risk for uneven settlement has also to be assessed, view the report “Dealing with Bearing Capacity Problems on Low Volume Roads Constructed on Peat ”. 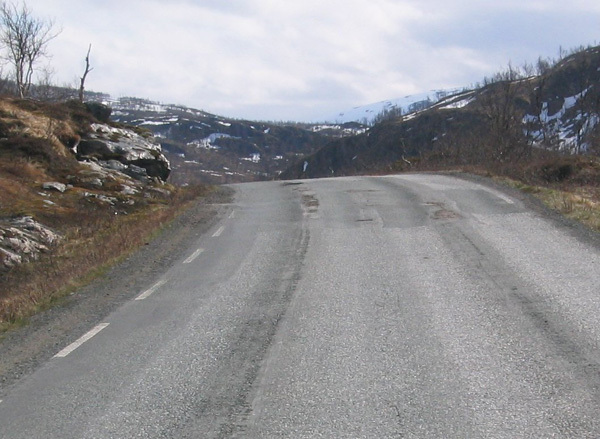 Another problem, regularly faced, is that the improvement of the vertical alignment in a valley requires more width for the road and this may need further land from adjacent landowners. 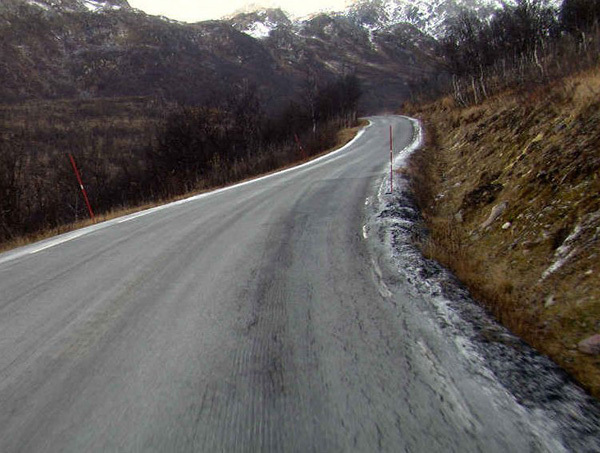 This can be reduced in some situations by using guard rails, but these can cause other problems. 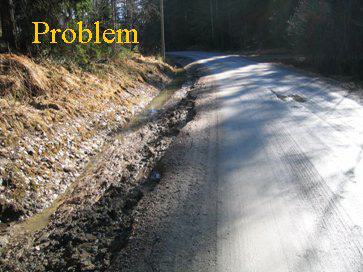 Low volume roads constructed on a bedrock cutting, or where the bedrock is close to the surface, are always special cases in design as they pose special problems. 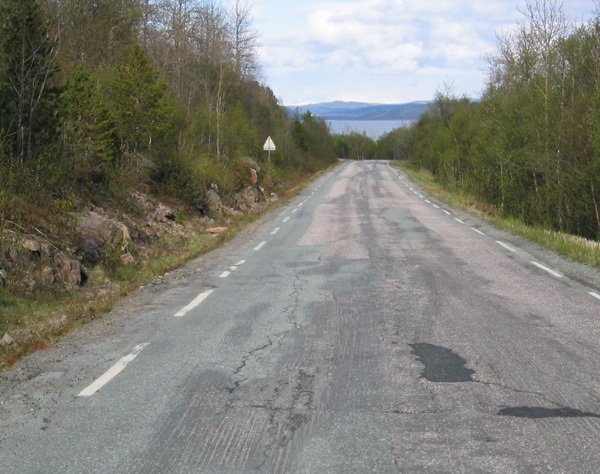 The rehabilitation of these types of road sections can be very expensive. 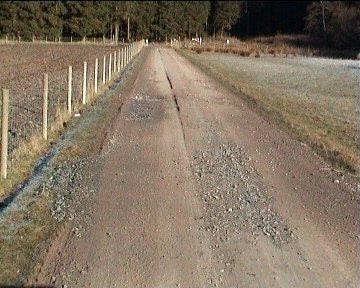 Bedrock prevents water draining from the road structure and this can lead to a reduced bearing capacity within the road. 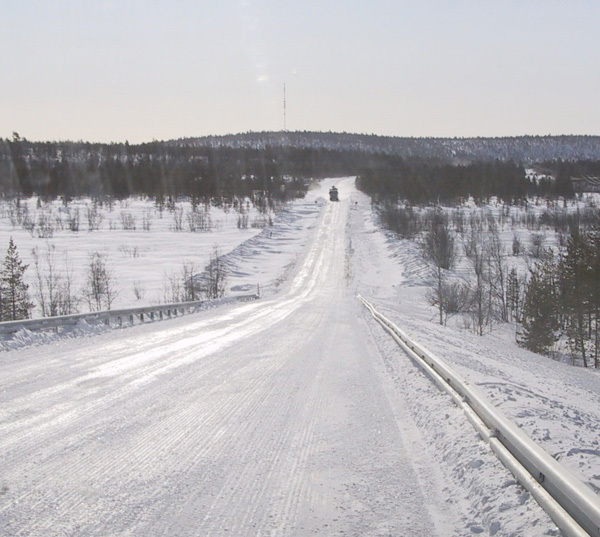 During the frost season, ice lenses can form on top of the bedrock and cause uneven bumps to be formed in the road surface. 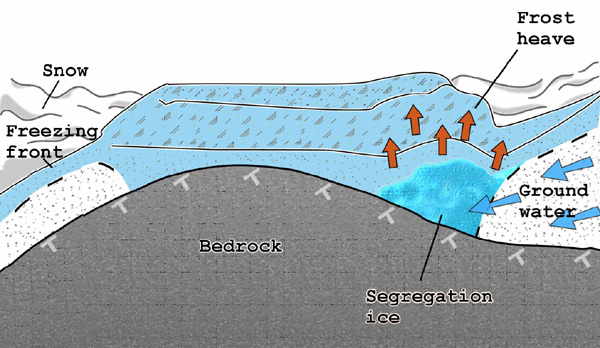 Any depressions in the bedrock surface will collect water and if there are frost susceptible materials in the road structure, segregation ice will form. 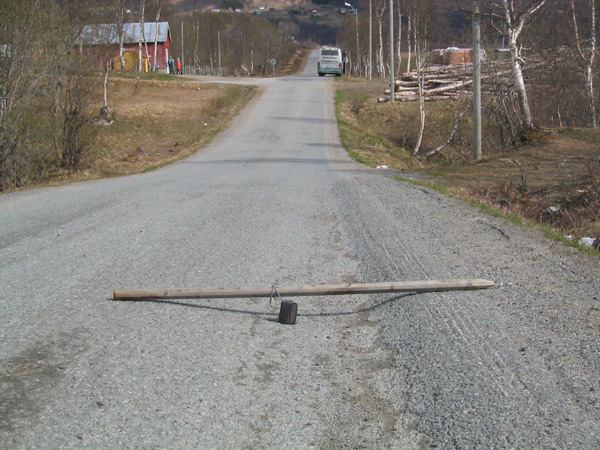 Bedrock may also block the flow of water under the road and/or cause water flows into the road structure from the roadside. 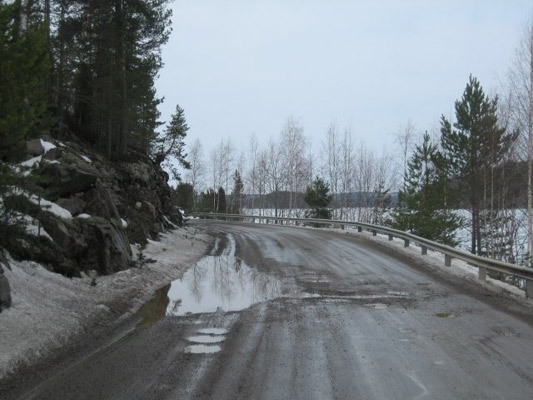 Bedrock and boulders can dam the water flow over long distances and this can cause differential frost heave. Build a new structure on top of the old and make sure that the layer thickness over the bedrock section is at least 40 cm. 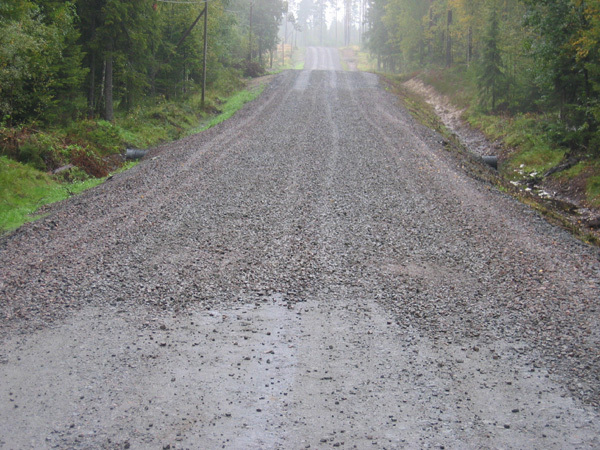 In the case of a paved road, the old bituminous pavement layers should be milled out first so as not to make a sandwich structure. 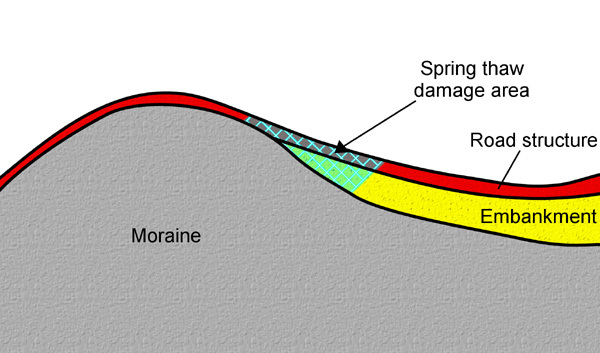 An animation describing how blasting a ditch in the bedrock, or providing deep drainage, can improve the performance of a road built close to bedrock. 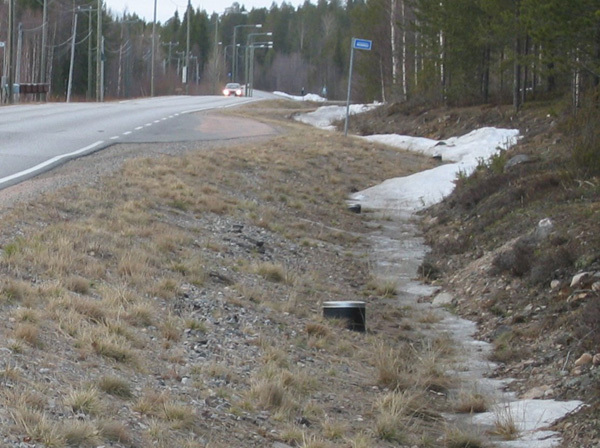 Drainage is possibly the most important factor to influence the development of permanent deformation but poor drainage can also create traffic safety risks. 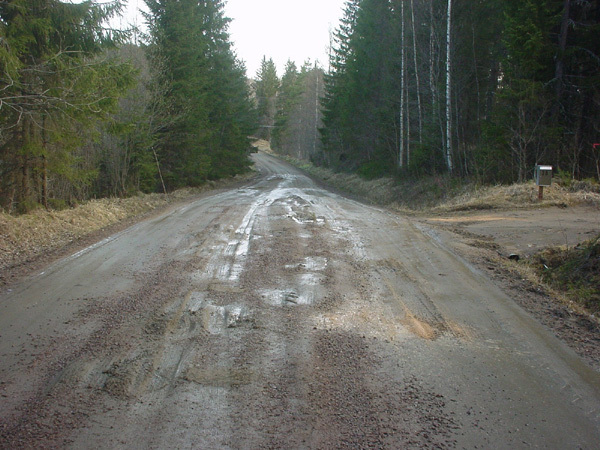 Permanent deformation hardly ever exists if excess water is not present in the road structures and subgrade soils. 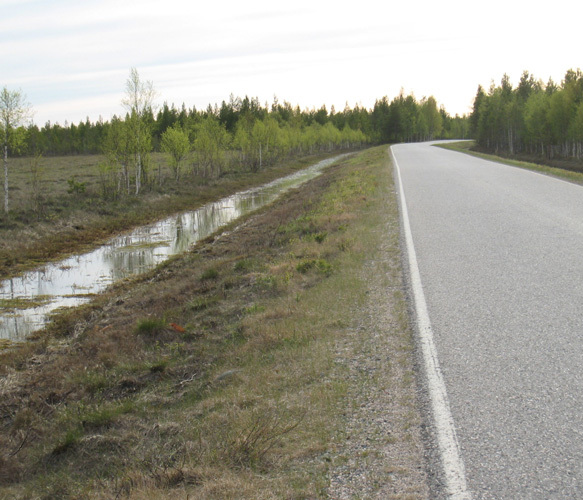 Results from the early ROADEX projects clearly show that keeping the road drainage system in a good condition is the most profitable maintenance action possible on low volume roads. And for this process an effective drainage monitoring system is essential. This is considered, together with detailed descriptions of classifications, analysis and diagnoses, in the ROADEX “Drainage” eLearning package.